Posted on May 30, 2013 Posted in Elementary, High School, Middle School, My Products, Teachers Pay Teachers	. This Wheel of Fortune PowerPoint template can be used to review with your class before big tests and exams! I like to use it to reinforce key vocabulary words and some of my colleagues use it for spelling practice. I’ve included the instructions directly from the PowerPoint file below so that you can get an idea of how it works. This template is recommended for PCs only because it uses PowerPoint macros for the scoring. Your version of PowerPoint probably already has macros enabled, but, if it doesn’t, watch this video to learn how to enable them. It’s super easy! Click here to check out this game template on Teachers Pay Teachers. 3 slides, includes basic animation. 1. Due to the nature of the Wheel of Fortune game, a round of this game is played relatively quickly (when compared to other TV game show games). That’s why this game template can be edited on-the-fly during gameplay. All you have to do is add the game category or clue to the top of Slide 2 (during gameplay), and the vocabulary word or answer that you’re reviewing (during gameplay), and you’re ready to play! 1. During gameplay, you can easily enter in the game category by editing the “Type Category Here” box. 2. During gameplay, you can easily enter in the review vocabulary by editing each individual tile on the game board. Use the underscore ( _ ) to represent letters that have not been guessed. You can edit each individual tile to add the letters as students guess them during gameplay. 3. During gameplay, you can keep track of the letters that have been used by entering them into the “Letters Used:” box. 4. During gameplay, you can keep track of each team’s points by entering them into each team’s respective points box. 5. To go to the wheel slide during gameplay, click the wheel toward the center-bottom of the screen. If you’re ready to play this game with your class, get it here! First off, this template is great. I purchased it to create a training exercise with it, but I was wondering if I could change the denominations in the wheel? Thanks for the kind words! The wheel is actually an image file, so it’s not editable on your end. What denominations did you have in mind? Will there be a version for Mac someday? Thank you for your interest in my product! 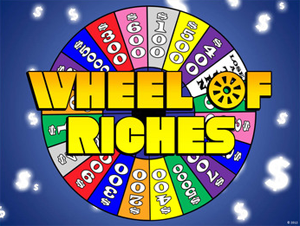 I would LOVE to create a Mac version of this game, however, this Wheel of Fortune PowerPoint Template is macro-enabled, which is a feature that is only available on PCs. The PowerPoint macros are an important part of the game, so, until Macs allow PowerPoint macros, I can only offer this for PC. I apologize for the inconvenience! Yes! You can edit the topics to fit your lesson!